The Adagio SP Itaim Bibi Aparthotel features flats and apartments with 1 room and a fully equipped kitchen. Leisure facilities with pool and fitness center. Laundry with automatic machines for guest use. Located in one of the best districts in São Paulo.C lose to the business centers of Av. Faria Lima, Av. Nove de Julo and Av. Cidade Jardim. Around the Itaim Bibi there are excellent bars, restaurants and shopping centers with a wide range of services. Apartment with two rooms (bedroom and lounge) measuring 344 sq. ft. (32 m2) in total, kitchen fitted with microwave, minibar, electric stove and utensils; WIFI Internet, LED TV with cable channels; desk The hotel also has non-smoking apartments. With a special menu, the Adagio Itaim Bibi Aparthotel offers a breakfast prepared with care and dedication, so that you can start your day with a true festival of flavors. Open from 6:30am to 10:30am Monday to Friday and 7am to 11am on weekends. Most of the staff was very pleasing, the room is nice, and everything went smoothly, until the last day. The valet parking guy scratched the interior of my vehicle, even though I specifically alerted him there was no need for the actual key, just the proximity sensor in it. He left the car parked with a lot of sensors beeping (handbrake wasn't pulled, gear was set in Neutral), and left cussing at me as if I was a &quot;Mr know it all&quot; while I still had to put my bags in the trunk I don't think i would mind as much if it was by accident, but now my brand new car bought June has the interior scratched (which i believe was on purpose given the attitude) and wouldn't ever recommend this hotel based on this single experience with the valet parking guy. Prezado Sr. Wander, Obrigada pelos comentários sobre sua hospedagem no Adagio Sp Itaim Bibi. Compartilharemos com nossas equipes e tenha certeza de que sua opinião será um encorajamento para melhorarmos a qualidade de nossos serviços. Caso queira compartilhar sua experiência com outros clientes, fique à vontade para deixar seu comentário em nossa página no Tripadvisor. Temos certeza de que outros clientes apreciarão suas impressões. 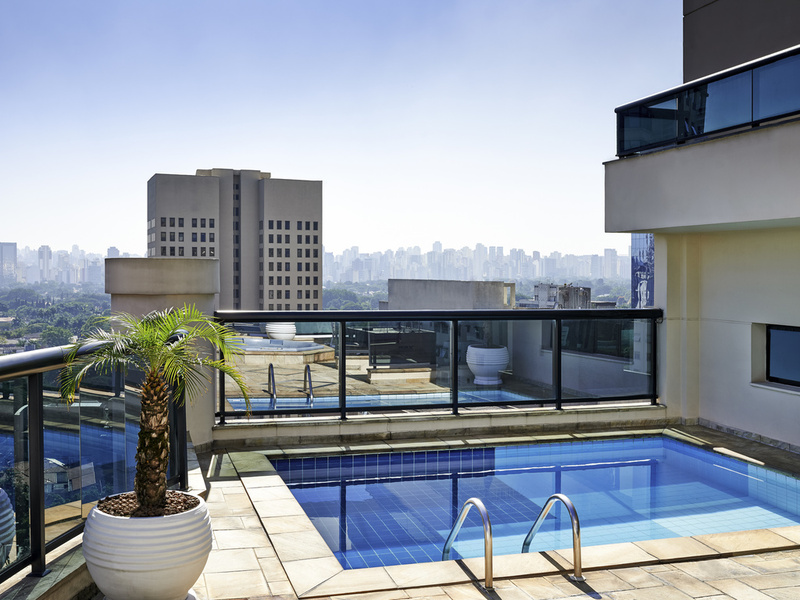 Segue link direto: https://www.tripadvisor.com.br/Hotel_Review-g303631-d300822-Reviews-Adagio_Sao_Paulo_Itaim_Bibi-Sao_Paulo_State_of_Sao_Paulo.html Agradecemos novamente e esperamos que sua próxima visita seja tão agradável quanto a anterior. Sinceramente, Daniela Teixeira de Almeida Gerente Geral Adagio SP Itaim Bibi Uma dica: Conheça nosso site e faça sua reserva através do: www.mercure.com e garanta benefícios especiais através do Le Club Accor Hotels. Se ainda não é um membro, associe-se agora: http://www.accorhotels.com/leclub : Diárias grátis, express check in/out, descontos na diária entre 10% e 50%, além de outros benefícios. It was probably the sith or seventh time at Adagio Itaim. This time I was at the first floor, which brought much noise to my stay. Front desk staff very pleasant and efficient. Overall the experience was great. The staff are really friendly at the front desk. The room was cleaned every day. The only 2 points that could be improved: 1) I had to buy toilet paper. When it was gone, there was no replacement. 2) The sheet set was missing one piece. It had only the 2 pillow covers and one flat sheet. I preferred if we had the fitted sheet and the flat sheet. Very clean and tidy, in a great location. Some more attention should be given to black out curtains, pots and pans. Other than that, just great. clean, good services, modern. I recomend. Location and service were great. The space was not great for a family, as we did not have enough space to store the luggage and it stayed in our way, but just for a few days it was manageable. It was only one night, almost all went good, only the light besides the bed was not working. Prezado Sr. Marcelo, Obrigada pelos comentários sobre sua hospedagem no Adagio Sp Itaim Bibi. Compartilharemos com nossas equipes e tenha certeza de que sua opinião será um encorajamento para melhorarmos a qualidade de nossos serviços. Agradecemos novamente e esperamos que sua próxima visita seja tão agradável quanto a anterior. Sinceramente, Daniela Teixeira de Almeida Gerente Geral Adagio SP Itaim Bibi Uma dica: Conheça nosso site e faça sua reserva através do: www.mercure.com e garanta benefícios especiais através do Le Club Accor Hotels. Se ainda não é um membro, associe-se agora: http://www.accorhotels.com/leclub : Diárias grátis, express check in/out, descontos na diária entre 10% e 50%, além de outros benefícios. The cleaning lady Adriana is very good and attentive. The room: older than expected, in the need of some renovation, lack of door. We have stayed at better rooms in the same hotel. More expensive than you get. I liked the hotel very much, because it has a wonderful breakfast and many nice people to attend. The air conditioning in the room is good and the bathroom has a great place to take a shower. On the other hand the bedroom is tiny and the living room doesn't have air conditioning. The staff is just amazing!!!!! Every single one makes you feel comfortable and welcome, day or night. The room needs repair and maintenance in several spots - hall door jammed, baseboards peeling off, dark spots in tile grout, kitchen cabinets doors jammed, leaking cooler, appropriate light needed in bedroom and living room, inadequate fabric on sofa (velvet), which can not be cleaned properly. The check in and out were very quick. The room had good space and was very clean. Breakfast was ok.
Prezada Sra. Luciana, Obrigada pelos comentários sobre sua hospedagem no Adagio Sp Itaim Bibi. Compartilharemos com nossas equipes e tenha certeza de que sua opinião será um encorajamento para melhorarmos a qualidade de nossos serviços. Caso queira compartilhar sua experiência com outros clientes, fique à vontade para deixar seu comentário em nossa página no Tripadvisor. Temos certeza de que outros clientes apreciarão suas impressões. Segue link direto: https://www.tripadvisor.com.br/Hotel_Review-g303631-d300822-Reviews-Adagio_Sao_Paulo_Itaim_Bibi-Sao_Paulo_State_of_Sao_Paulo.html Agradecemos novamente e esperamos que sua próxima visita seja tão agradável quanto a anterior. Sinceramente, Daniela Teixeira de Almeida Gerente Geral Adagio Sp Itaim Bibi Uma dica: Conheça nosso site e faça sua reserva através do: www.mercure.com e garanta benefícios especiais através do Le Club Accor Hotels. Se ainda não é um membro, associe-se agora: http://www.accorhotels.com/leclub : Diárias grátis, express check in/out, descontos na diária entre 10% e 50%, além de outros benefícios. Rooms were clean and well-kept. No amenities for travelers: power outlets were all local and not international-friendly. Some staff didn’t speak English.